The special day for mommies has come so it's about time for us to tell all the mommies out there and to our mothers as to how greatful we are for giving us life. I wanna thank Francine for forwarding me these very interesting meme. You too can tell why your mom is the best by simple posting your reasons and don't forget to add your link! 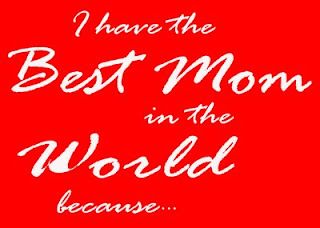 Spread this tag and tell the world that you have the Best Mom! Bregie- her love for us is endless! Le bric à brac de Cherie -she's always there to give my spirit a lift when I am really down and she never get's tired of loving me and the entire family. I wanna be like her! I am planning to purchase another domain but I am still in the process of searching a good web hosting. We all know that there is an array of web hosting available online but only few of them are genuine on the service they offer. I would definitely try a web host that has zero down server. I sometimes stumbled a blog that is down because the web host server is down and I am pretty sure it's annoying not seeing your blog whenever you open it. Good thing I found welove.dreamhosters.com. With them you will have 55 reasons to choice them. I am pretty sure I will scan on this dreamhost to know more about the site. You can also avail of their $50% off dreamhost promo codes. If you have any question about their web hosting you can contact them using the contact form at http://welove.dreamhosters.com/about/. To all the the mother's out there HAPPY MOTHER'S DAY. May this day brings us joy and happiness. Anyhow this is our day so might as well make use of this day. **winks** Being a mother is not easy as you will be the one to take all the needs of your kids and husband. So to all the stay at home mom and working mom around the world I salute you. My boyfriend asks me to check houses that are for sale last year. I am surprised to see same houses that I checked last year. To think that it is more than a year now. Another house that is for sale is in my town it’s almost 2 years when I first saw the billboard out side their house. Because of this I know selling of house can be difficult and nerve-racking. The only way to be worry free is to hire someone who will act as your representative or a realtor. But do you know that there is a place where you can have the money for the payment of your house in few days. Properties direct is into quick property sale, they give house owner that wants to sale their house cash for property. They specialize in purchasing land and property direct from the owners. They will buy the house under any circumstances and will guarantee to buy your property within 7 days or within the period of your specific period of time. They have been serving to the people for over 20 years now proving domestic and commercial property.